Google+ is going popular social networking site in the world. It connects the users in one place to share the news, photos, videos and more. Users can chat with other friends and make hangouts between them. Hangout enables video conferencing between the friends. If you are an addicted mobile user, you can get mobile application to enjoying this features on mobile also. Google plus released its mobile app for Android and iPhone users so you can access Google plus anywhere and anytime. 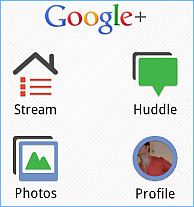 Lets see what are the features in Google+ mobile application. Messenger works like as Google chat. You can chat your google plus friends with normal chatting or group chatting. The green symbol on friend's name indicates they are currently online. Google+ provides instant upload support that you can upload your photos from mobile directly and instantly. This saves your photos in your online albums and this will be the second backup of your photos. So never lose your files due to any corrupted problems. You can limit who can see your albums also. Hangouts make face-to-face video chatting with your friends. You can make video chatting up to 9 friends or simply join into already going video chatting. Click chat application of your any friend and then click on camera icon to start a new hangout. Make different circles of your different friends like office, school, neighbours and so on. You can control your sharing by who can get your updates and not. You can see all of your friends what saying on your stream. If you don't like anybody, you can block his updates. If you have other phones, you can access Google plus via your phone's browser. Go to your browser and simply type "http://plus.google.com". good and timing info . thanks. and i have been addicted social webs and internet. so if i leave from pc i would be free and concentrate my works and my friends who meet in person. but if use internet through mobile phone :-) my career would be spoil.